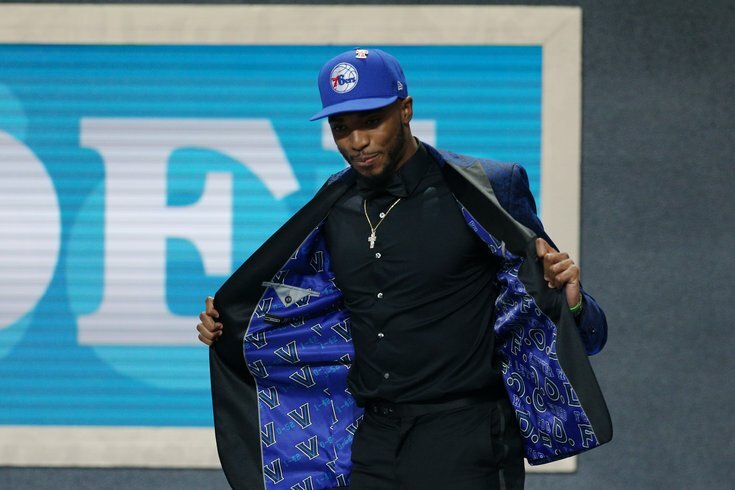 Mikal Bridges (Villanova) walks onto the stage after being drafted by the Sixers — but before being traded to the Suns. Since Joshua Harris took over as owner of the Sixers in 2011, the team has failed spectacularly at the subtle art of public relations, but nothing will ever rival what happened last Thursday night at the NBA draft. Even now, four days later, it’s hard to believe, isn’t it? For 38 minutes, Villanova hero and Philadelphia native Mikal Bridges lived his childhood dream, gushing at a news conference that being selected by the Sixers with the tenth pick “means everything to me.” His mom, Tyneeha, was even more thrilled. She works for the team, in the very same Camden, N.J., building where her son soon would be practicing. Then, in mid-gush, word spread that interim GM Brett Brown had just traded Bridges to Phoenix for a less-experienced prospect, Zhaire Smith, and an unprotected 2021 first-round draft pick. There is no evidence that a team representative ripped the Sixers hat right off Bridges’ head, but the effect was the same. Once again, our basketball team proved that, at least off the court, it has no concept for image at a time when fan perception has never mattered more in sports. And, even though he acknowledged that the human element of the trade was “disturbing,” Brown was the last person in the organization expected to act so callously. The coach wasn’t responsible for the team’s refusal to use the name of its own arena. He wasn’t there when the owner’s helicopter landed on a soccer field and ruined a kids’ game. And Brown was an innocent bystander to the Bryan Colangelo Twitter fiasco of last month. No, the one person in the organization who ever gave a damn about the team’s image since 2011 is Brown, and he still went ahead and crushed a family’s dream. I’d love to be there the next time Brown bumps into Tyneeha Bridges in the lunchroom. Of course, if the deal made sense, the less sensitive among us might have rationalized the situation by saying the team would have a better chance to win the Eastern Conference next season, if not the NBA title. I’m still trying to find a draft expert – any draft expert – who thinks Smith will be better than Bridges in 2018-19. And next season is supposed to be the top priority now, isn’t it? Didn’t we all just wait five years – including four historically bad ones – so that tomorrow could finally become today? Now we’re supposed to celebrate a deal that will bear fruit three years from now? No, thank you. Unless Brown makes good on his promise to go “star-hunting” and uses the draft pick to acquire San Antonio superstar Kawhi Leonard, there was no good news last Thursday night. The championship pedigree and refined shooting skills of Mikal Bridges now reside in Phoenix, while fans get to watch Smith try to find the range with his own fickle jump shot. What I have been saying for the past six years bears repeating one more time. As a Sixers fan for over half a century, I can say with conviction that cheering for this team has never been a greater challenge than during these Joshua Harris years, and that’s despite the awe-inspiring potential of Joel Embiid and Ben Simmons. Even in the lean years right after the Iverson era, there was no New York billionaire (Harris) or his slick CEO (Scott O’Neill) to offend the fans at every turn, no wooden Sam Hinkie or Bryan Colangelo to ignore the most basic questions from a tragically loyal fan base. Only since Harris arrived — in his helicopter, no doubt — has rooting for the Sixers been a chore, if not an embarrassment. Last Thursday night was the culmination of this sorry era of tone-deaf public relations. Right now, I hate the Sixers. And I’m pretty sure I’ve got some company this time — Tyneeha and Mikal Bridges. Gabe Kapler did something totally unexpected in the ninth inning of a big game Saturday in Washington. The Phillies manager used the best arm in his bullpen, Seranthony Dominguez, to close out a 5-3 victory. As usual, Dominguez dominated the three batters he faced, striking out two. He is throwing the ball 98 miles per hour, often with a cutting action, and he is the biggest revelation of the season for the Phillies. Last night, with a chance to sweep the Nationals, Kapler rushed Dominguez into the game, presumably for a five-out save, but this time the rookie failed, allowing the winning runs to score in a brutal 8-6 loss. These decisions by the often-unpredictable manager raised several questions: Is Kapler abandoning his original premise that all of his relievers should be interchangeable? Has he identified Dominguez as the closer of the future? Oh, yeah; there’s also this one: Does the rookie skipper have any idea how to manage a bullpen? I get the chance to talk to Kapler on my WIP radio show every Wednesday, and I have asked him about Dominguez’ role at every single opportunity over the past two months. The answers have never varied: Isolating Dominguez in the closer role is not the best way to use him. What if the most important outs are needed in the seventh or eighth innings? As usual, Kapler — with a major assist by his analytics-obsessed GM Matt Klentak — is trying to re-invent the game. I even asked him at one point if the Yankees were using Mariano Rivera wrong for all those seasons, and all those championships. Or how about Brad Lidge the year the Phillies won it all? He suggested, indeed, that there might have been a better way to employ the best closers of the past generation. But when I pointed out that, in the past 10 days alone, he ended up using Jake Thompson, Adam Morgan and Hector Neris in high-leverage situations, he merely suggested that sometimes the game goes in unpredictable directions. Thompson and Neris are back in the minor leagues now and Morgan would be there with them if the Phillies had a good lefty reliever in the system, and yet these stat nerds still believe their way is the right way. Well, now we’ll see if they really believe that. Despite his failure last night, Dominguez is, by far, the best option to pitch the ninth inning. If the Phillies are really serious about remaining in contention for the playoffs, they will throw all of their computer printouts in the trash and use the young pitcher in the role where he belongs. When is the last time you watched every pitch of a Phillies game? I asked this question on my WIP radio show last week and got exactly one caller who proudly announced that he had nothing else going on in his life. For everybody else, it is the unspoken truth about our long-gone American pastime, whose games have become an exercise in endurance more than a source of dependable entertainment. This unwelcome change is especially ironic here in Philadelphia, where the Phillies have found unexpected success embracing analytics. And make no mistake – analytics are the main reason that baseball has become unwatchable. What was once a slow game is now an excruciating one because of the emphasis on deep counts, defensive shifts and countless pitching changes. Try to watch every pitch of a game. I dare you. • In this new analytics age, a ball is put in play every three minutes and 45 seconds. • Strikeouts are at an all-time high this season – 22 percent of all plate appearances end with a K.
• The National League has only four teams with more hits than strikeouts. • Attendance is down 6.7 percent. I have every intention of offering my own opinions on the Phillies the rest of this season and for as long as they remain relevant. I just want everyone to know that I will be basing these views on games that are best experienced in highlight packages, not nine very long innings. •	The Eagles don’t have to do anything these days to win over their fans, but still they did something terrific earlier this month when they presented a Super Bowl ring to Carol Wilson, a secretary in the organization for 30 years until ex-coach Chip Kelly fired her in 2015. Since Joe Banner left as president, the Eagles have understood the value of treating people well, especially in a passionate sports city like ours. The Sixers would be smart to follow suit. Just don’t bet on it. •	One of the long-term benefits of the Eagles winning the championship last season is getting to watch the New England Patriots unravel after their stunning loss in Super Bowl LII. In just the past two weeks, Tom Brady said he was contemplating retirement and coach Bill Belickick reacted to player gripes that playing for him was no fun by cutting minicamp short for a team-bonding experience. More and more, it’s looking like the Eagles ended an era of success in New England. •	A Philadelphia team has completely revamped its medical staff, and it wasn’t the Sixers. No, the Eagles replaced their head trainer and two team doctors last week despite the championship. Why? The most educated guess is that this is the fallout from the ugly way Jon Dorenbos ended his long tenure here. When he got to his new team, New Orleans, the Saints doctors immediately found that the long snapper had a life-threating heart condition. Dorenbos is fine now — and even received an honorary Super Bowl ring — but the Eagles trainer and team doctors are out. Of course, this is just an educated guess. •	NBC Sports Philadelphia fired sideline reporter Molly Sullivan last week for no good reason. TV rating are at a six-year high, and she conducted herself with class and professionalism for the past five seasons, four of which were among the worst for any team in NBA history. When I asked her why she thinks she was pink-slipped, she said she had no idea. No one from the network offered any complaints during the season. Doesn’t a sports network that relies on people speaking to them owe Molly and her fans an explanation? •	The hero of the week is a sweet woman named Kathy McVay, who was hit in the face by a hot dog launched from the field by the Phanatic. Sporting a black eye and other abrasions along her forehead and cheeks, McVay said she had no interest in suing the Phillies. She just wanted fans to know that they should protect themselves when the duct-taped hot dogs are flying into the stands. That’s the kind of fan we can all embrace. Bravo, Kathy.